Aum: Fwd: Islamic architecture, what's that? Architecture is a product of geographical conditions, materials available, levels of development of society and the need for protecting oneself from the environment. Architecture is nor denominational. It is cultural and civilisational. The term Islamic architecture is part of the same project that had divided history into Hindu and Muslim. The term is a colonial orientalist legacy. Read any text book of history or architecture in the subcontinent, and increasingly in the world outside, and you will come across the term Islamic Architecture. The elements of Islamic Architecture, we are told, are the arch, the dome and the minar or the minarets. The first large-scale use of the true arch, in aqueducts, is ascribed to the Romans in the 3rd century BCE. The Roman engineers acquired many of their engineering skills from the Etruscans (ancient Italians going back to the 7th century BCE) and the Greeks. The Corbelled arch which preceded the true arch goes back much further in history and the Trabeate arch, the precursor to the Corbelled, would probably go back to the first gate built by humans in a pre-historic time, difficult to pinpoint now. The true arch defined by Leonardo da Vinci as "strength created by two weaknesses" was to find expression in various forms including, but not restricted to, the Horse Shoe, the Trefoil, the Gothic, the Tudor, the Lancet, the Elliptical and the Pointed. The Pointed Arch became more popular in the Middle East and central Asia and travelled to north India in the 13th century. By the 17th century — the time of Mughal Emperor Shahjahan — another variation of the true arch, known as the Scalloped or the Cusped arch came to rule the roost. Structures built in the late 17th and 18th centuries using this arch came to be described as Indo-Islamic architecture. And when elements of the Gothic revival architecture were mixed with this form it came to be known as Indo-Saracenic or described variously as Indo, Mughal or Hindoo-Gothic. 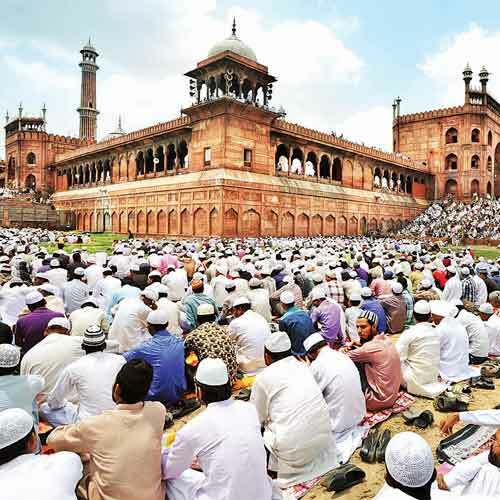 Gradually the latter terms fell out of use but Islamic and Indo-Islamic remained. The Sasanid or the Neo-Persian Empire (224-651 CE) began to build large-scale domes and it was perhaps the neo-Persians that developed the technique of the squinch, a technique that gradually transformed a square into a circle upon which a dome could be constructed. The minar, probably derived from manara (Light House) in Arabic, is in all probability a pre-Islamic architectural form, that could have been built as a guide at night. Later incorporated into the mosque architecture, in India, the mosque-minar association is not so old. The minar in a mosque, the steeple in a church, the shikhar in a temple all served the same purpose and these forms evolved when people believed the world to be flat. Old mosques in Kashmir, Indonesia, Malaysia and in a whole lot of places do not have domes or minars or arches. These forms are the product of a specific region from where they spread. They have no endearing bonds to any religion. The largest dome in the world sits atop the Basilica of St Peter. There is another atop the White House and none of the US presidents have been Muslims.